This post is sponsored by Target. All words and opinions are my own. Inspired by the hustle and bustle of the holidays, I'm using products from Target to create three quick and easy updos to elevate the holidays into the most fabulous time of the year! It's official: The airwaves of KOST 103.5 FM are jamming to holiday music around the clock, which means the most magical season is here! I'm trying my best to plow through a packed calendar flowing with end-of-the-year meetings and projects, holiday shopping, eggnog toasts, and a robust scattering of errands, which means I'm out all day and all night. Most of the time my hair is the last thing on my mind but a dose of easy hairstyles have inspired me to play with three updos that are quick to do and complement any and all holiday looks. Hair prep: Updos work best with textured hair that's just a little bit dirty, so don't shampoo the day before! To make my hair more manageable before every updo sesh, I spritz roots with Umberto Dry Texture Spray and create loose, voluminous curls using my Sarah Potempa Beachwaver. 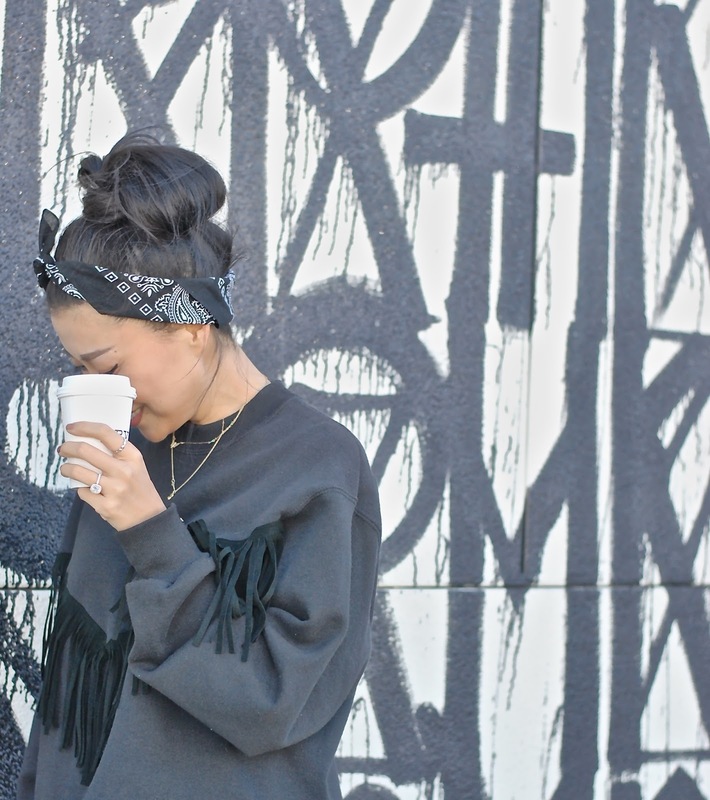 Infusing a traditional topknot with a bit of style, this easy updo stays frizz-free all day with the help of a bandana and my CHI 44 Style and Spray Hairspray! I start by brushing my hair into a top ponytail using my Sonia Kashuk hairbrush, which combs up all the loose strands. Then I pull my hair halfway through and tighten it into a small bun, with the extra hair sticking out. I then wrap the extra hair across the front of the small bun and fasten it with bobby pins. Last, I spray the front with more hairspray and tie the bandana for a headband effect. It's an easy way to look fab while running errands! I've been wearing the hun (half bun!) since summer, as it's an effortless update for my long hair. It's also a versatile 'do for day and night, as I wear it to meetings, brunch, work, date nights, and even late-night rendezvous with Netflix. It's also super easy and quick to style. Simply gather and tie the front three-quarters section of your hair using a mini hair tie, and then abstractly wrap your hair into a loose bun and hold it with bobby pins. No need to fix the flyaways, as the style is meant to look a little messy. For holiday parties and nighttime festivities, I like to look just a bit more polished. My Target fur-trimmed cape is fabulous and cozy and an easy piece to take any daytime outfit into glam territory. To match the dressy vibe of the cape, I wear my hair in a braided bun, as the braid keeps the bun sleek and in place. And the 'do is so easy to achieve! 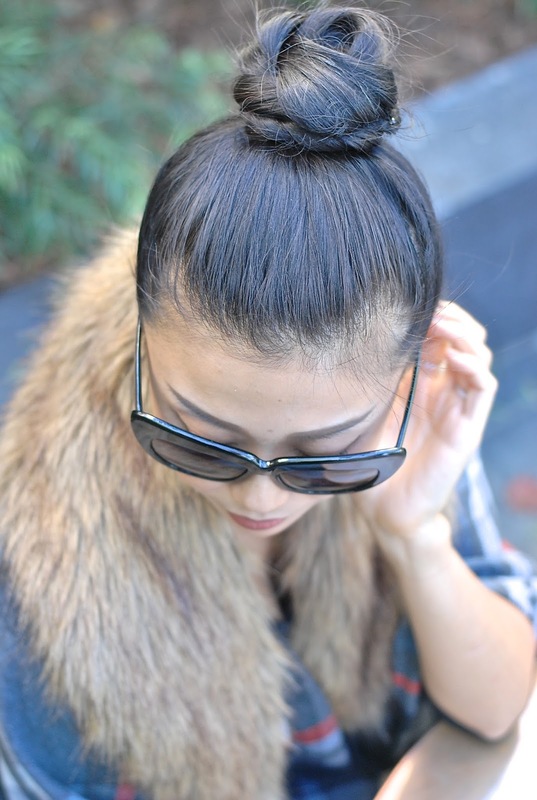 Simply braid a high ponytail, wrap, and pin!